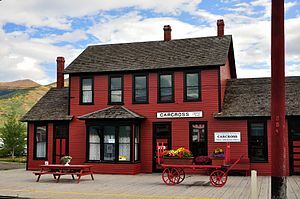 Carcross railway station in Carcross, Yukon, Canada is a railway station which is used by the White Pass and Yukon Railway train service. The station is the northernmost terminus for passenger railway services on the line, with connecting bus services to Whitehorse, Yukon. The building was designated a national heritage railway station in 1991. The building was originally built in 1910 for the White Pass & Yukon Railway, being in service from 1910 until 1982. Service was later re-instated in 2007. This article about a building or structure in Yukon is a stub. You can help Wikipedia by expanding it. This article about a railway station in Canada is a stub. You can help Wikipedia by expanding it. This page was last modified on 29 October 2012, at 22:39.